Best Solution (blue) has set up a possible Melbourne Cup tilt with his Group Two win at Newmarket. Best Solution has taken a step to a possible Melbourne Cup campaign with victory in the Princess of Wales’s Stakes at Newmarket. 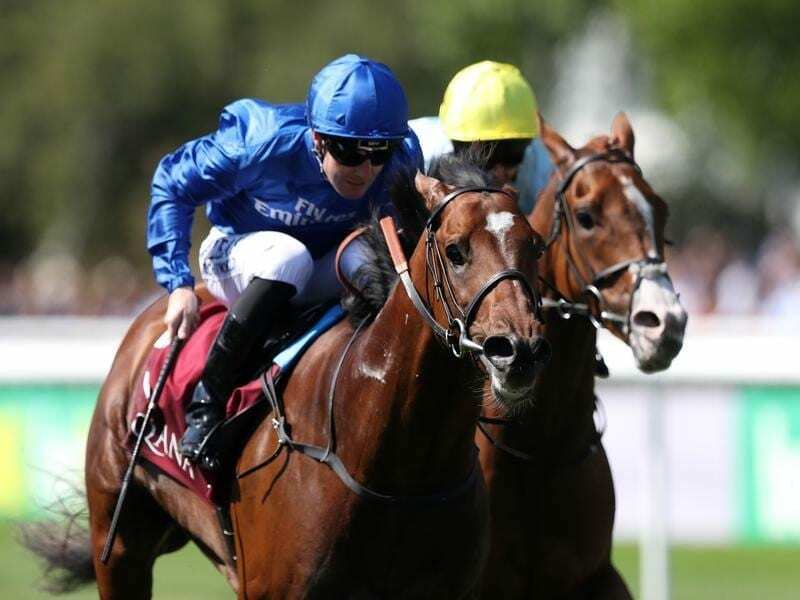 Last seen finishing fifth in the Dubai Sheema Classic behind Hawkbill, the Saeed bin Suroor-trained Best Solution ran saw the 2400 metres out strongly as he held off the determined challenge from Mirage Dancer. “I’m always looking for Group One winners, but Group Twos are all right,” Saeed said. “After he was fifth in the Sheema Classic, we talked to Sheikh Mohammed and said we would give him a bit of time. Andrew Balding could also look at the Melbourne Cup for third-placed Duretto. “I’m very pleased with him. He’s a high-class horse. He is rated 114 and it is a bit insulting he was 25-1, really,” Balding said.